Bishop Nicholas of Myra in Lycia (in an area of Turkey now) was a Bishop of the early Christian Church during the early 4th century. He died on December 6th somewhere between the years 342 and 352. To the right is shown a picture of St. Nicholas as he would have appeared in the 4th century. Note that St. Nicholas is holding the Gospels, and is depicted with Christ and Mary, the mother of Jesus. It is easy to see how the Spanish name for this Saint, Santa Nicholas, and the Dutch name, Sinterklaas - his celebration by the church in December, and the day of Christmas could have been confused into the current Santa Claus of today. Mass marketing hype has now turned a man, beloved by many for his continued devotion to Christ, his unwavering support of unaltered Christian doctrine (as handed to the early church by the Apostles), and his piety and love for others into an inflatable glowing "Lawn Santa". You can see why we feel that honoring the real St. Nicholas with an annual festival is a worthy endeavor. For us, this celebration is a great way to start the period leading up to Christmas! In this painting from a German Christian card, St. Nicholas is shown, again with his Bishop's stole and Gospels, but also with a staff and in more Roman Catholic attire. Our "St. Nicholas" is our parish priest, Father Thomas Moore, of Holy Apostles Orthodox Church, with the blessing of our bishop. As you can see, Fr. 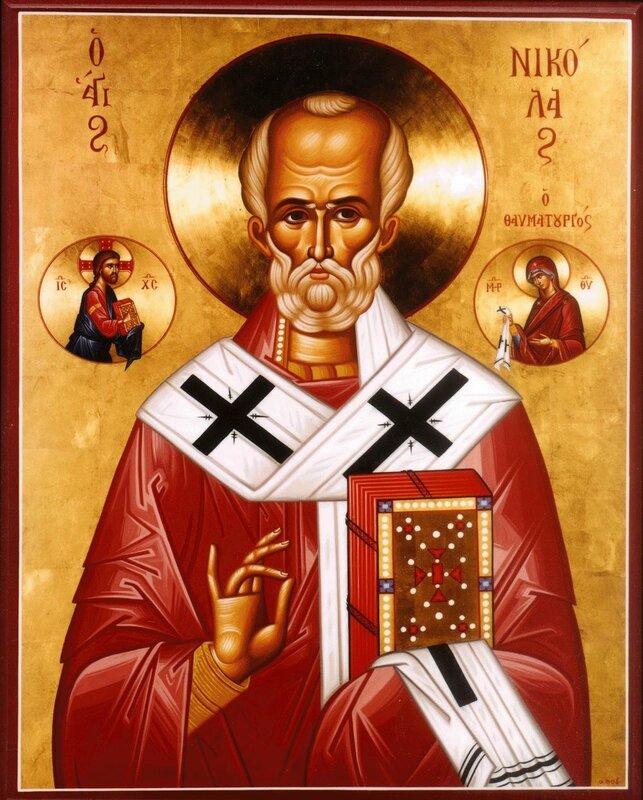 Thomas gives us a chance to "see" St. Nicholas on this day, dressed much as he would have been when he was at the Council of Nicea in 325 A.D. - when the Nicene Creed was formed, and the basic list of the books of the Bible were established. Though our St. Nicholas doesn't take requests for presents, he gives a "chocolate golden coin" to each child, reminiscent of a famous story of the real St. Nicholas' generosity. To find out more about St. Nicholas, visit the sites at the links below.